For most golfers, the hand and/or wrist is the 3rd most common body region injured, after the back and elbow. 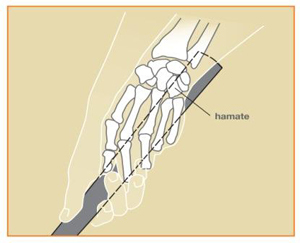 The wrist is injured 3 times more frequently than the hand. In golf, the action of the wrist is important for the “snap” of the shot in long shots, and the precision “feel” in short shots. Golfers who lack strength in their forearms are more prone to wrist and hand injuries. The leading wrist/hand (left side for right-handed players, right side for lefties) is most at risk. 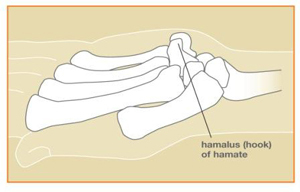 Injuries result either gradually from overuse, or from a traumatic blow (hitting a root or a rock, or hitting a fat shot off hardpan) causing sprains (ligament injuries) or fractures (“broken bones”). The most common wrist/hand complaint is due to tendonitis (tendon inflammation) of any of the tendons that cross the wrist. Treatment usually consists of rest, splinting, ice, and non-steroidal anti-inflammatory medicines. If these initial treatments fail, cortisone injections may be used at the discretion of your doctor. The elbow may be affected with "golfer's elbow". which is a painful tendonitis on the inner aspect of the elbow at the origin of the "flexor/pronator" muscles. 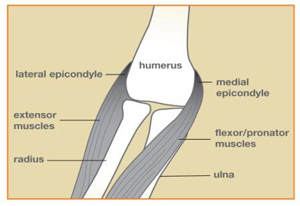 They originate off of a bony prominence of the humerus (arm bone) called the medial epicondyle, and so this condition is also called "medial epicondylitis" (see Figure 3). It can be caused by repeated swinging stress to the elbow, and may result from many other non-golfing activities, such as heavy lifting and hammering. Lateral epicondylitis, on the outer side of the elbow, is also commonly seen in golfers from repeated strain to the lead arm, similar to hitting backhands in tennis (see brochure/web page on tennis elbow/lateral epicondylitis). Both these conditions are usually first treated with rest, a physical therapy program of muscle stretching and strengthening, and non-steroidal anti-inflammatory medicines. If these initial treatments fail, cortisone injections may be used at the discretion of your doctor. In a small percentage of patients, non-operative treatment is unsuccessful, and your doctor may recommend a surgical procedure that entails removal of the degenerated part of the tendon and possible tendon repair. 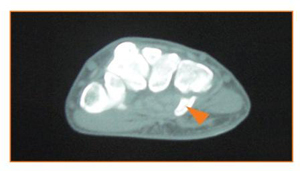 Figure 3: Elbow showing muscles as they originate from medial and lateral epicondyles. Another potential cause of injury when golfing is the unsafe use of golf carts. Golf cart accidents with fall-outs and tip-overs may cause very serious injury such as fractures to the wrist, forearm, elbow, arm, shoulder, tibia (shin bone), and ankle, among others Proper care and caution must be exercised when driving golf carts.